Sailorette's Vintage Life & Style: Summertime Daily Glamour and A Bit of Art: my hectic sunday. Summertime Daily Glamour and A Bit of Art: my hectic sunday. Sunday morning I went to Oeiras with the family who was visiting. It was sunny and warm, but I had nothing lighter to wear! This is a lovely place right by the train station, in the Oeiras Yacht Club & Docks, and I'd strongly recommend it for a bit of sightseeing and relaxing if, like me, you get that little urge to watch the ocean often. You can find some shops, cafes and restaurants on the docks, besides the Club, and it's just near the beach, with a special lane for bikes and pedestrians, so it's a win-win situation - whatever you want to do, this is the right place for it. Case you're wondering what I'm wearing, the headband, dress and tights are from H&M's last sale, the shoes are from Aerosoles and the bag is Heart E, bought from Amethyste Boutique in Porto. 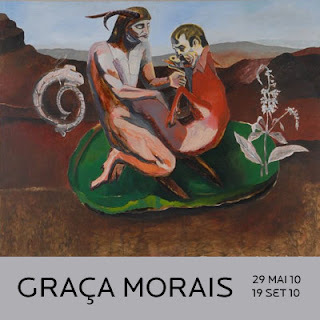 After the light, summery lunch that was due, I went to see this wonderful exhibit in which I had the pleasure of meeting the artist herself once more - Graça Morais at Centro de Arte Moderna Manuel de Brito (Palácio Anjos in Algés). It was far from being your ordinary Graça Morais exhibit, but also not a retrospective. Since the CAMB staff organises their exhibits from the late Manuel de Brito's private collection, these works are unusual, different, personal and scattered from bits of the artist's life and artistic evolution. Ranging from 1982 to 2005, scenes from her visits to Africa and Japan were present amidst personal gifts to the family of the collector (to whom she was close), portrayed in different techniques, sizes and media, hence making it a truly unique experience for the public. Curiously enough, I met the artist there while visiting her own exhibit and got to exchange a few words - I had met her when I was eleven, in the school I attended at my hometown, and the experience had contributed to my liking of the arts, whilst growing up. She even complimented my outfit - my jaw dropped for a second. For those who know less of her work, she has been widely influenced by the portuguese traditions and culture, more specifically around the area of Trás-os-Montes, and this presence is one of the determining traits of her painting - you can always find the landscapes and the people as she sees them, and have a priviledged view into her imaginarium from these. One of the works I didn't know yet. A gift from the artist, I'm so very happy to have met her once more! Later, I waved my parents goodbye once more and got a call from my friend and tattoo artist Sandra Duarte inviting me to go to Rock in Rio see Megadeth, Rammstein and Motorhead that same night, since she had a VIP pass for me, and the rest's history! I loved the concerts and meeting the bands, it was a lovely evening. Here you have a picture of what was in my bag when I got home! I'll be spending some time visiting my friends in Porto this weekend so I'll bring you new tales of higher grounds soon! PS: I definately recommend you try to visit the exhibit in a near future and try their special activities around the exhibit's themes and scenes. Que boas ideias que dás para um dia de Verão na zona de Lisboa. As propostas de lazer, de grande qualidade e muito acessíveis e a forma como as apresentas, deixa qualquer pessoa rendida. Woww, you lucky gal! You went to RIR for free, and with a VIP pass! That dress is lovely, i saw it on h&m before and thought it was cute, but it didn't suit me. It looks lovely on you though! Keep having fun, and tks for the bracelet. MA: Obrigada, fico lisonjeada e espero continuar a corresponder!